LSU is a better team than we are. LSU is better than anybody, except perhaps Alabama. Garret Uekman, a 19 year old Razorback Tight-End, seemingly in perfect health, died suddenly, last Sunday of what doctors described as an enlarged heart condition. Having said that, we are a better team than how we played the last quarter of yesterday’s game, or for that matter the last 2 & 1/2 quarters when we were outscored 41-3 after taking a stunning 14-0 lead with 12 minutes left in the 2nd Quarter. At that point in the game, I didn’t just think we were going to win, I thought we were going to blow them out. We were executing well on offense, moving the ball. And more importantly we seemed to be stopping them when we were on defense. Not only did we take the crowd out of the game, they were actually beginning to turn on their team. LSU was about to fold. As a matter of fact, in a way they did fold. On what would become their first scoring drive, as the fans were booing, they seemed rattled, fumbling the ball twice (the second fumble was fumbled forward for 8 yards which enabled them to gain a first down on a fluke play) Arkansas was playing with too much cushion on defense or else they would have recovered that second fumble that squirted 8 yards ahead of the LSU running back. Another time on that drive, when we had them stopped, their player dove his head down into our defenders hand and got a face mask and 15 yards to keep the drive alive. I really believe had we stopped them on that drive, they would have folded, and the rest of the day would have been ours. But it wasn’t to be. And suddenly, in what seemed like a blink in the eye, all the momentum changed towards LSU, and they were off to the races. Another couple key moments spring to mind as momentum changers. Obviously without any doubt the 92-yard punt return by Mathieu. Many will say that was the key turning point in the game, and they may be right. Any time another team takes one to the house on you, it’s always an emotional blow, no matter what the circumstances, but these circumstances were anything but normal: A No.1 team playing a No.3 team on national television with implications of a National Championship on the line. Add to that, that one of their own, a player who had been on the very same field as they, only a week before, had suddenly died on Sunday, leaving young minds no time to process the unexplainable tragedy, and one can understand that any team in the nation would be equally emotionally stunned. That made it 14-14. Still, mustering emotional strength from no one knows where, the Razorbacks didn’t fold and fought on. On the subsequent drive they were moving the ball and the chains nicely. Dennis Johnson had a nice run to pick a first down, and it felt like Arkansas was going to score, but then he fumbled going down, and that one seemed to be the proverbial “straw” or “nail” that the Razorbacks couldn’t come back from. It’s not that they didn’t have the heart or the talent. It’s that they were emotionally and spiritually drained, and under the circumstances, who can blame them? They overachieved all year. They improved from beginning to end. They fought hard even when they were playing their best and managed what seemed like victory after victory from the jaws of defeat. They became winners. By anyone’s standards this was a championship year, a championship team, and more importantly a real leap forward for the program as a whole. Arkansas Wine Is Absolutely Outstanding! 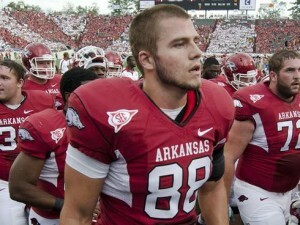 This entry was posted in Sports and tagged Arkansas, football, razorbacks on November 26, 2011 by Stephen Pickering.